Today we met up for our first official meeting at Cafe Allegro to get to work on researching existing healthcare and doctor-finding options. Outlook: bleak (for current existing options) and hopeful (for our purposes). Most existing options seemed either to be nonfunctional or designed in such a way as to make them very difficult for the user. 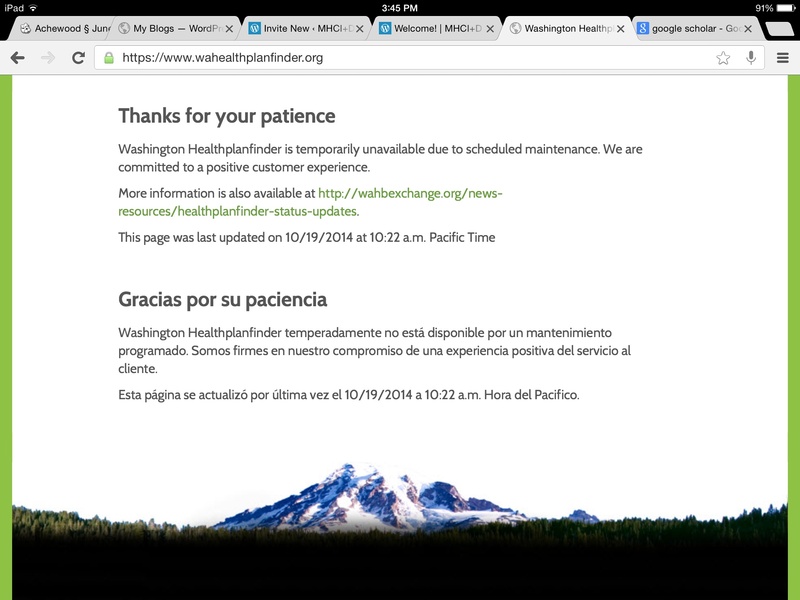 To start, we looked up Washington Health Plan Finder, the go-to first option for Washington residents. This is what we saw. Scheduled maintenance is a necessity, but the fact that this extremely important portal was down during peak hours on a weekend—when most people would have free time to settle their insurance—was telling in and of itself, and would come to be a theme. Most of these insurance and doctor-finding services are extremely user unfriendly. Actually trying to use one of these services was equally mystifying. The GroupHealth provider-finding tool returned extremely few options for any particular specialty, often only a single entry, even when we knew that more providers with that specialty existed in Seattle. 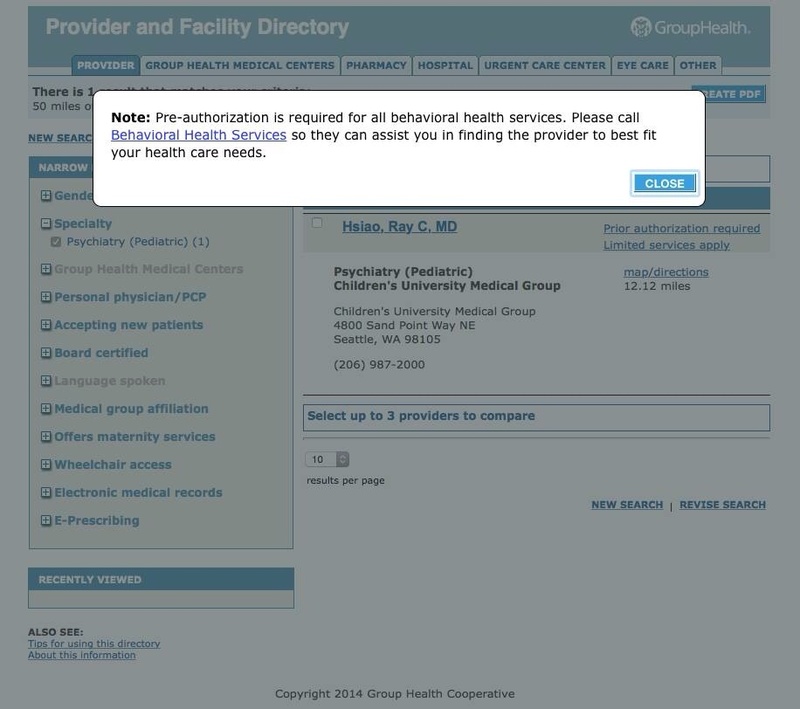 When we tried to see how more details were shown for a given provider (a pediatric psychiatrist), the tool stopped us cold, requiring us to call a behavioral health services number to get any further—even though we weren’t trying to make an appointment. Even Premera’s site had some serious usability issues. The site itself was attractive, but there seemed to be little to no prioritization of one option over another, and the information architecture behind the site resulted in menus that looked like…this thing. 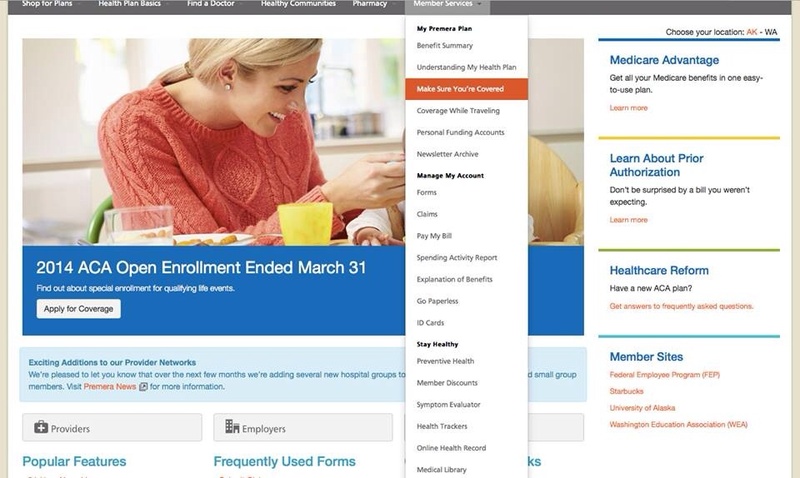 A major concern we had was that, as none of us are Premera Blue Cross customers, we were completely unable to access many of the tools offered, as they required a login. This means that potential customers have no way to preview what these tools might be like. Obviously, this is problematic. From there, as we continued to write down questions we had, we started looking through research databases and Google Scholar. It was honestly pretty difficult to find any articles at all that were relevant amidst the tidal wave of “Obamacare is unconstitutional” articles and similar. Most of what we did find were articles and white papers stressing the importance of doctor-patient compatibility, which brought up what Tracy said during the presentation: a dating site-like matching system could actually feasibly work for connecting patients with compatible PCPs, if it could be implemented. That got us thinking about existing sites that use matching algorithms, like OKCupid, which gleefully declares at the top of its blog, “we experiment on human beings!” The site is extremely transparent about its practices and matching, so we looked into how exactly that works. It was simpler than we expected. This concept has a lot of promise for use in matching patients to doctors, though there is an issue: getting users to answer questions is easy, but how could we get this information from providers, who may not want to release information about their weaker aspects? 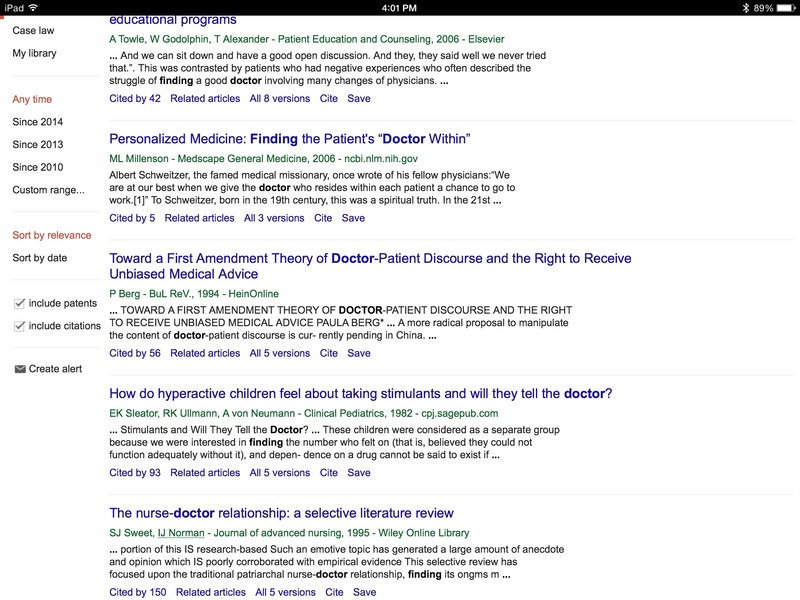 Overall, our research indicated that the health insurance and care industry may be efficient on the back end, but some work may be required in order to make the experience less baffling/mystifying/frustrating to users, who may have a difficult time finding the information they actually want right now amongst that which could potentially be useful in the future, but is given equal importance by the websites.